It was a good call- this top is adorable! I made this top using my Apron Top Tutorial. 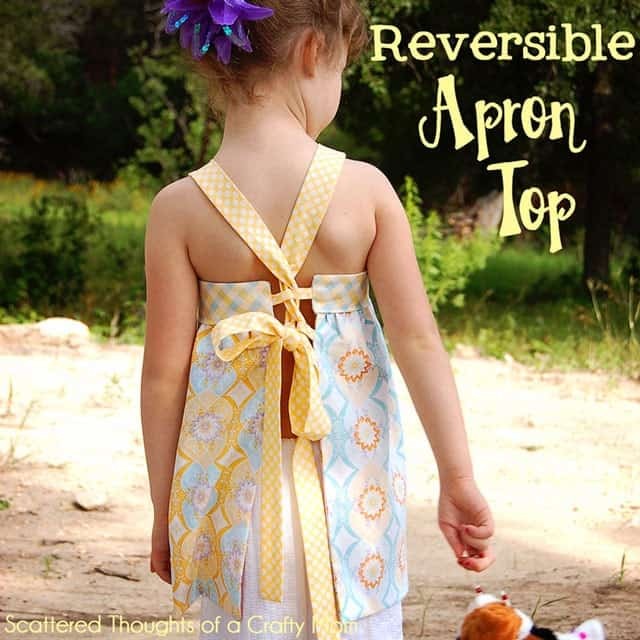 The reversible top is made almost the exact same way, as the original top. (The bodice was already double layered with the facing.) The only thing you need to do to make it reversible is to cut 2 of the bodice bottoms, put them right sides together and sew them together 1/4 inch from the edge around the sides and bottom. Then flip it right side out, iron the edges and continued on following the tutorial. *** Update*** I uploaded the pattern for this top. You can find it on the Apron Top Tutorial Page. For this version, I used a fat quarter set from Riley Blake, called Promenade. To have enough fabric for the bodice bottom, I pieced together 2 fat quarters and then hid the seam by covering it with a contrasting 1 inch ruffle strip. Now, if only I could get my hands on more of that yellow polka dot fabric I used on the straps, I would love make a pair of coordinating shorts! 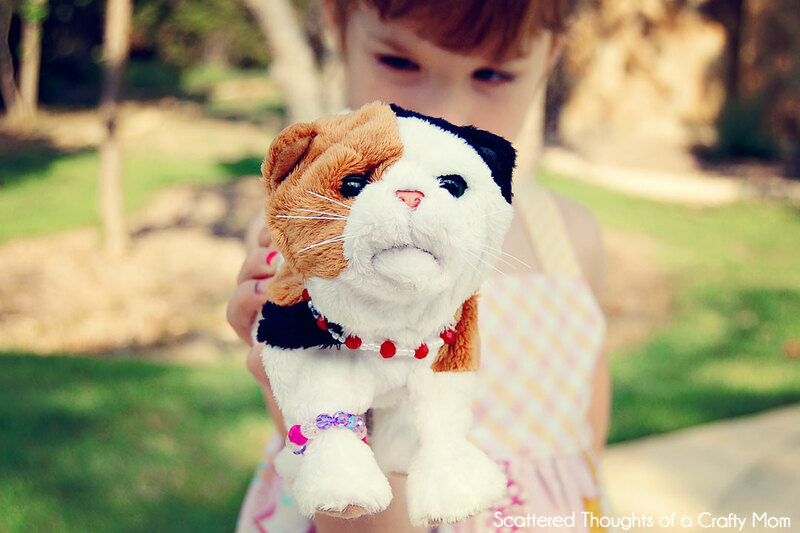 Meet Whiskers, the sweetest, most bling-ed out Fur Real kitty around! So cute from the back! I did add an extra set of loops for the ties, but they didn’t look how I imagined they would, so I might remove them. « My Skirt Made the Top 10, Please Vote for me! That is SO cute!!!! I am definitely Pinning this! I would love to try it! This is so beautiful! I want to make one with matching shorts as well! I love this! 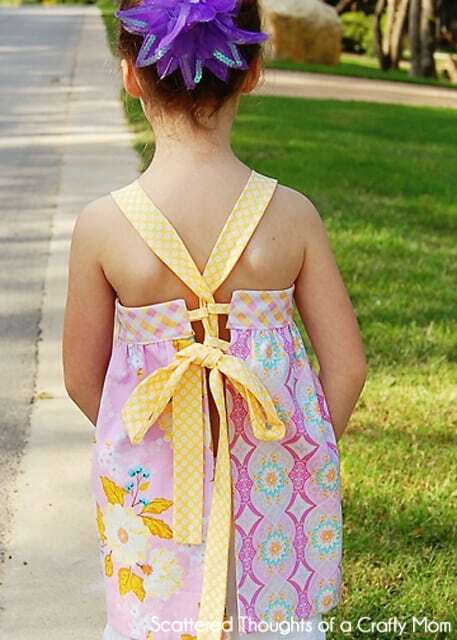 It's super creative and fun, and the ties and ruffle are just adorable! I'd be thrilled if you would share this at my current link party so everyone can see how cute this is! This is adorable! I would love for you to share this at "I Made This" at Grits & Giggles going on right now! This is SO cute! Great job! I'm a new follower. This is an adorable top! How adorable! I have got to make each of my daughter one. How long did yours take to make? This is the second one I made, so it went much quicker. It's hard to guesstimate how long it took because I rarely make something in one sitting. I usually sew in short bursts spread over a day or two. Once you have your pattern you could finish the non-reversible top in just a few hours. I will say, that it took me several days just to make the fabric choices! So cute! The fabric choices are spot on! SUPER CUTE! SO Precious! Crossing my fingers you'll share this at my party! Saturdays at Seven! Super cute. The colors and design are fabulous. Sometimes I think it would be fun to dress up a little girl. I'd love for you to link it up to our link party! I love this top! This is gorgeous! Great pictures. I would love for you to link this to my Sunday Slice party. 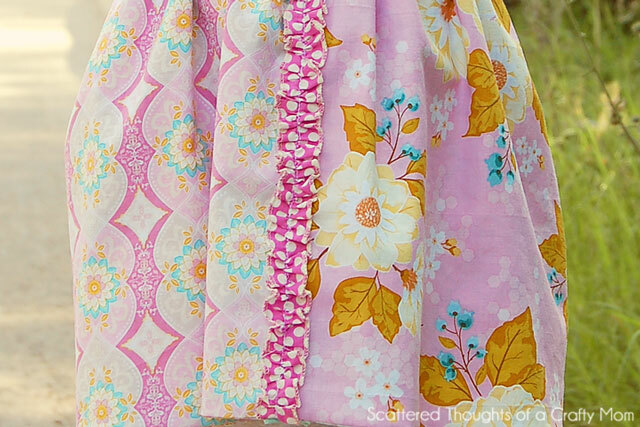 This is really sweet – and I have about 1.3 billion fat quarters in darling prints to use – can't wait to get started!!! 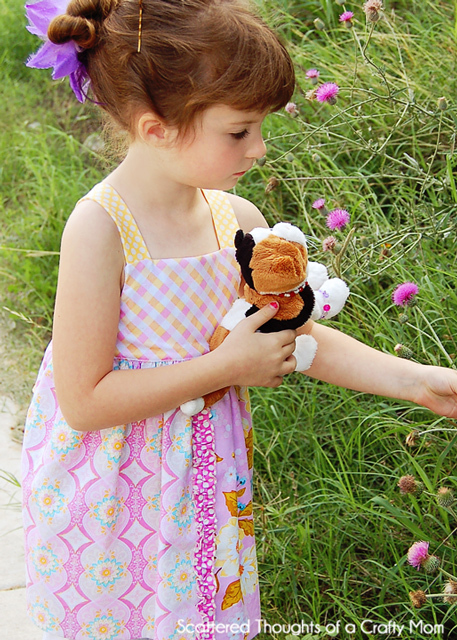 Adorable – love love love the fabric combination, and your model is beautiful too! So beautiful!! Oh, I will definitely have to make my daughter one as well. Thank you for sharing at Sharing Saturday!! Very cute! I have some fat quarters jut waiting for this! Come by sometime! Thanks soooo much for sharing this at The DIY Dreamer.. From Dream To Reality! Can't wait to see what you link up this evening! Love the fabric! It turned out so cute! This is so adorable!!!! On the "must sew" list for sure!! Thanks for sharing!